With a net yearly gain of 210pts (11.4%) to sp'2058, the bull maniacs have managed a sixth consecutive yearly gain. Yet.. what about next year? Can the rally really keep going, with the US fed no longer printing? What about the collapse in Oil prices.. is it a problem, or will the global economy experience a major boost? The irony of my target is not lost on me. Considering the continued QE of the BoJ and ECB, along with low energy prices, a major down wave (D or C) seems highly unlikely. After all, the equity bears had another major opportunity in October... and what happened then? Ohh yeah, the central bankers were all wheeled out, the market soared, and never looked back. So, the issue is... a continuation of trend.... or an acceleration? 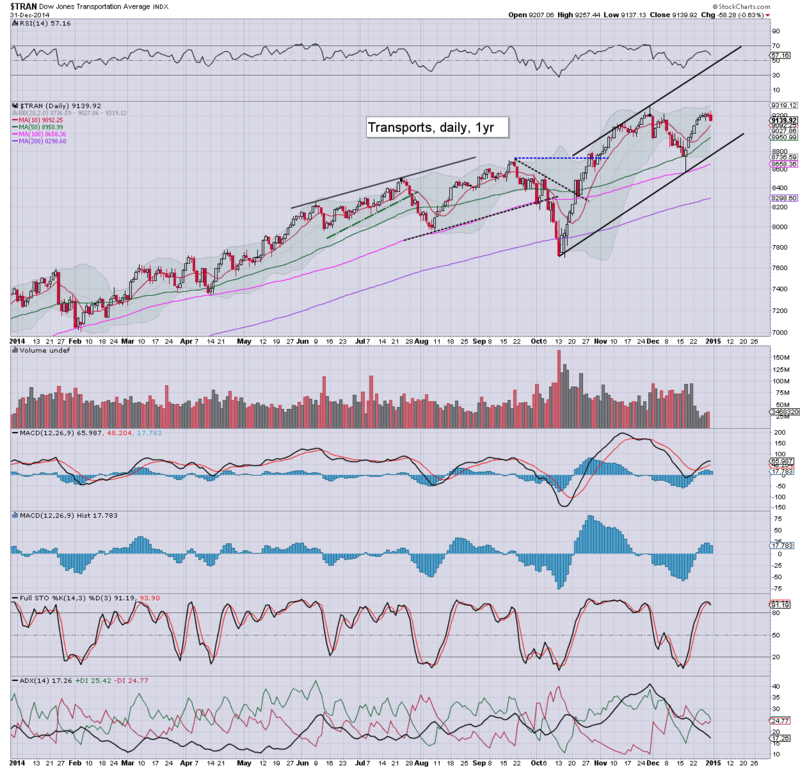 The mere continuation of the current trend from the Oct'2011 low of sp'1074.. would offer 2350 by end 2015. Certainly, that fits with the upper end of the mainstream outlook. Yet.. what about low energy prices and continued QE in Asia/Japan? If you consider both those issues to be a major positive to the world economy, then I believe an acceleration of trend is more likely than not, especially in the latter half of 2015. Also, of particular note are the lower support levels. 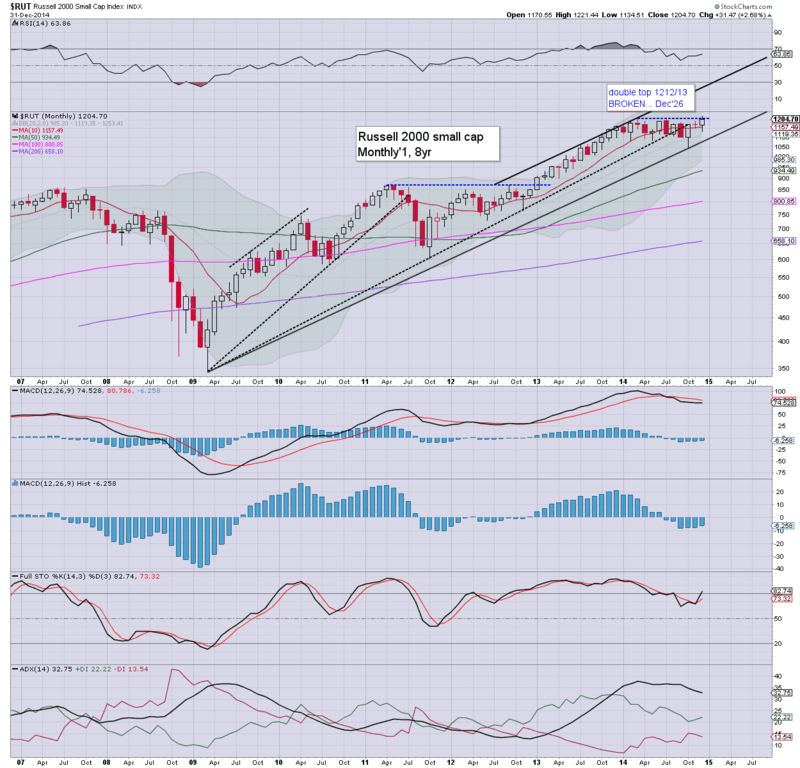 By summer 2015, equity bears only need to break sp'2k... and by year end.. 2100. Right now.. those seem easy downside targets.... but I'm seriously dubious that we'll break 2k at all next year. I realise that is extremely bold to suggest, not least since we're currently only 2.9% away. 1655 fibo34, I have no idea. I do feel this is likely to be SHTF year and I like the 7 year cycle but against that the 5th year of the decade is usually the most bullish year in Gann's decennial cycle. 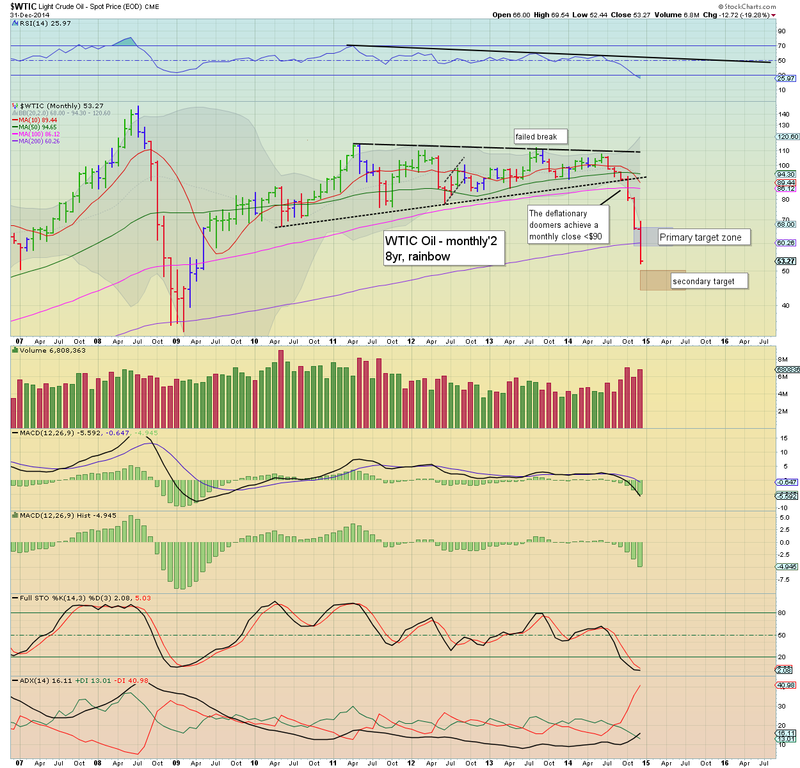 1700 N0BBY, $SPX yearly high at 2480 sometime in Q3 then waterfall declines into end of Q4. Oil WTIC to end the year at USD$25, so all you Brits driving tiny cars should get some gas-guzzling American imports! Gold at $800 and silver at $12, which I hate to say as I am a long term stacker of physical. 1800 John, SPX 1650 on 31.8.15, GDX 35 on 31.12.15 While the long bond had a bullish 2014 it started out at a lower low and has not put in a higher high than the 2013 high. TLT has however gone on to new highs, a stunning disconnect. A massive squeeze of bond shorts apparently that has little to do with actual rates other than to exaggerate the 2014 long bond move that has been bullish for the year but nothing like TLT. So will TLT drag the long bond to new highs or is it a coyote about to experience gravity? Compare BGEIX to the ETN for yield steepening. 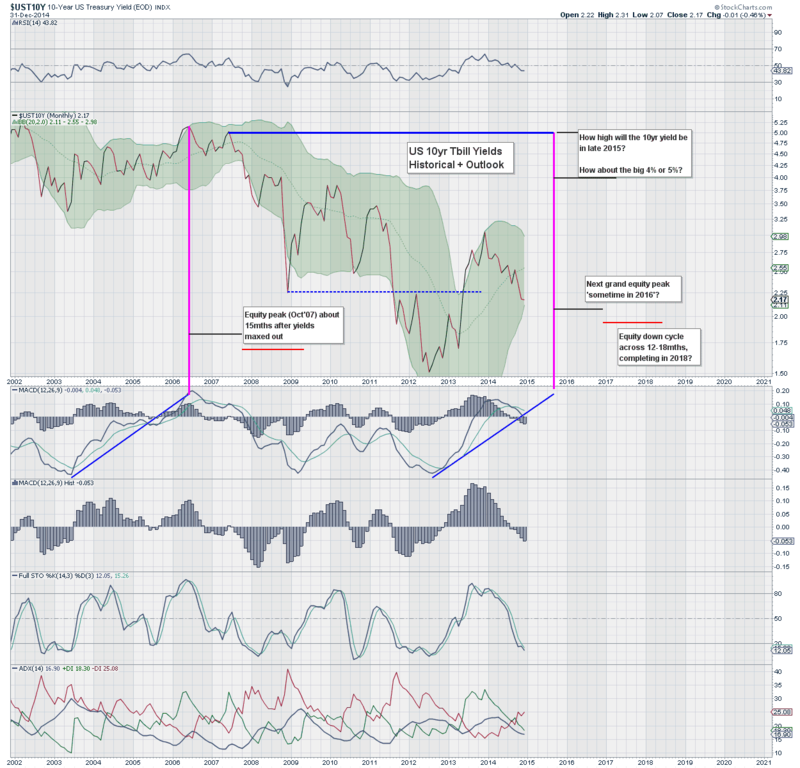 TLT compared to USB is hinting that the momo for long bonds is waning and that the longer bear since 2012 in the long bonds will reassert itself. If the yield curve begins to steepen as indicated by a rise in STTP, this could be the impetus for BGIEX to move up dramatically although with a slight delay as shown on a chart comparing BGEIX with STTP. I think there is a decent chance that BGEIX could be around 15 at the end of 2015, if the steepening of the US Bond yield curve plays out and the longer term bear in the long bond reasserts itself. 1900 springheel_jack, … necessarily a pretty wild guess but I'm going to go with 1900. I suspect that the bulls aren't going to have a banner year in 2015. I think this amazing move up is ending. We should retrace 20% or so and then start the next move up. 1950 Bill, I gave a lot of thought to this and it comes down to one thing. Will there be an economic slowdown in 2015. The drop of oil in and of itself means nothing, unless it is accompanied by a decline in the performance of the economy. And my guess is that the weakness abroad is structural and will continue, Europe and Japan are on the border of a recession and China is slowing down. The drop in oil prices needs to be understood in the context of a recessionary or better low economic growth environment and not just on a purely supply glut as it was in 1986. As a result I expect a moderate decline in stock valuations, and the S&P500 to trade around 1950 by the end of 2015. Oil will trade around $40 and gold will fall below $1000 at the end of 2015. The 10 year yield rate will continue to decline from the current 2.17% to 1.5%. 2200 WavRider, just over 2200 for the high of the year, then a 19% correction starts so the end of the year depends on how quick a bounce. If she rolls like she did in Oct and Nov we could pump out a 19% correction and still finish the year higher than 2200, no problem! Lets Roll! 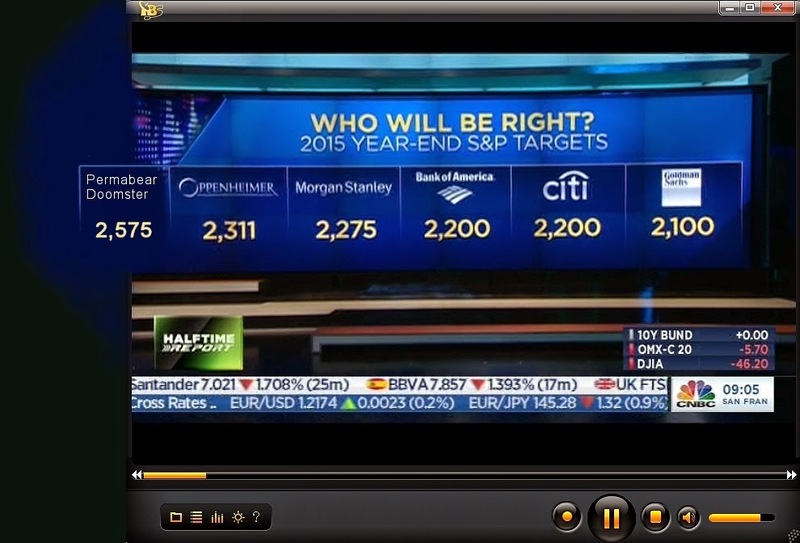 2300 jose jimenez, I say S&P ends at 2300 after a major correction in the spring time. Gold goes down to 800 and finish around 1050 by year end. Dollar will continue to see highs and no hikes on interest rates. Seeking an acceleration in the trend from Oct'2011, especially in the second half, after an anticipated US interest rate rise of 25bps – sometime at the FOMCs of March-May. If so... a second rise to 0.5% in late autumn seems equally likely. US growth set to continue (2.5-3.5%).. not least as (fleeing) capital floods into the USA from the EU and Asia. QE via BoJ and ECB will continue to prop up the weaker EU/Asian economies. *I remain open to taking targets for a little while longer, if you want to be added... please just post your target (with any notes you like) via Disqus or send me an email! Finally, a note that I do (mostly) hope I am wrong on my outlook. If the equity market somehow starts to unravel next year.... that is most certainly 'fine' by me. I'll merely start picking up index shorts... and even be long VIX. As ever, for the serious/big money, trading stops (of at least some degree) will solve the uncertainty problem. We have a very long year ahead.... what is for sure though...... it won't be boring! As 2014 turns to 2015... it has unquestionably been a sixth year for the equity bull maniacs. 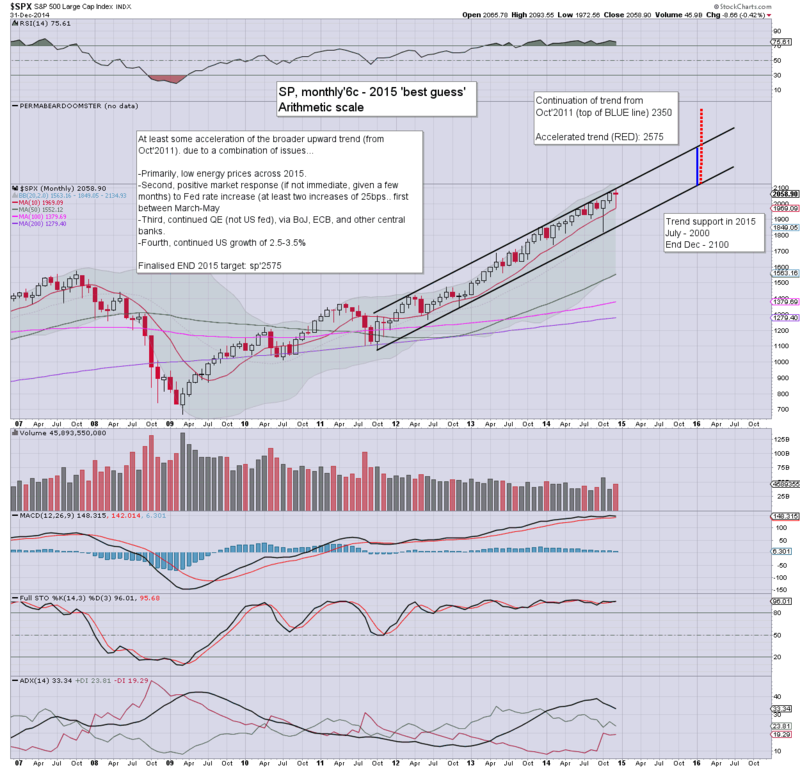 The sp'500 saw a net gain of 210pts (11.4%) settling at 2058. Perhaps the most notable aspect of the year, was the collapse in energy prices, with WTIC Oil swinging from a June high of $107 to the $52s. *see my Gold page for details on the precious metals. A key aspect of 2014 was QE taper. Despite some distinct weakness from the Alibaba top of September to mid October, the market has coped very well with the cessation of Fed money printing. As many have recognised, despite the Fed ending QE.. the BoJ and the ECB are continuing to print, and much of that money is flowing into the US. 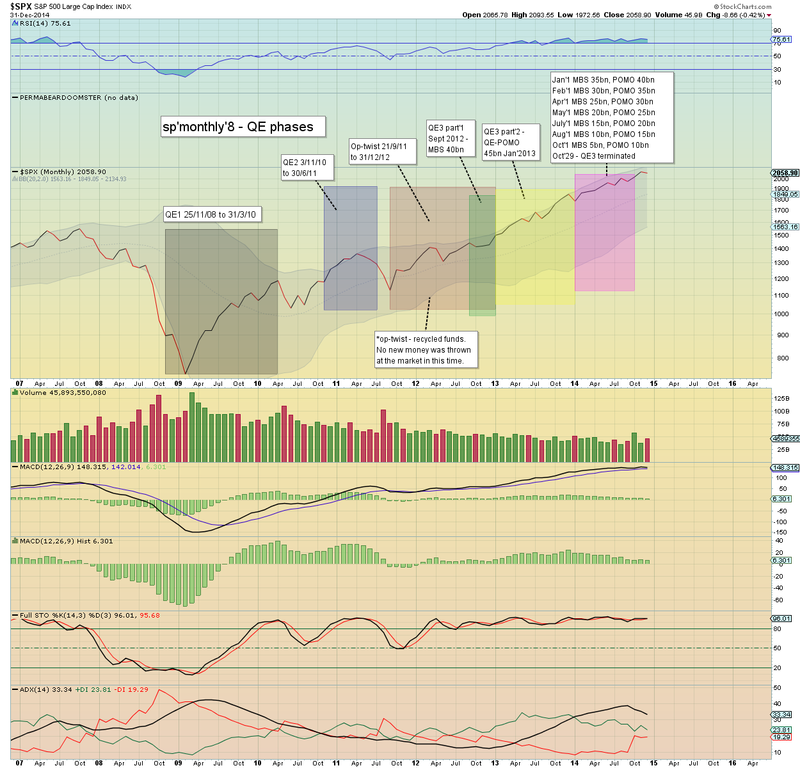 It is now a case of indirect QE... helping to push US equities broadly higher. 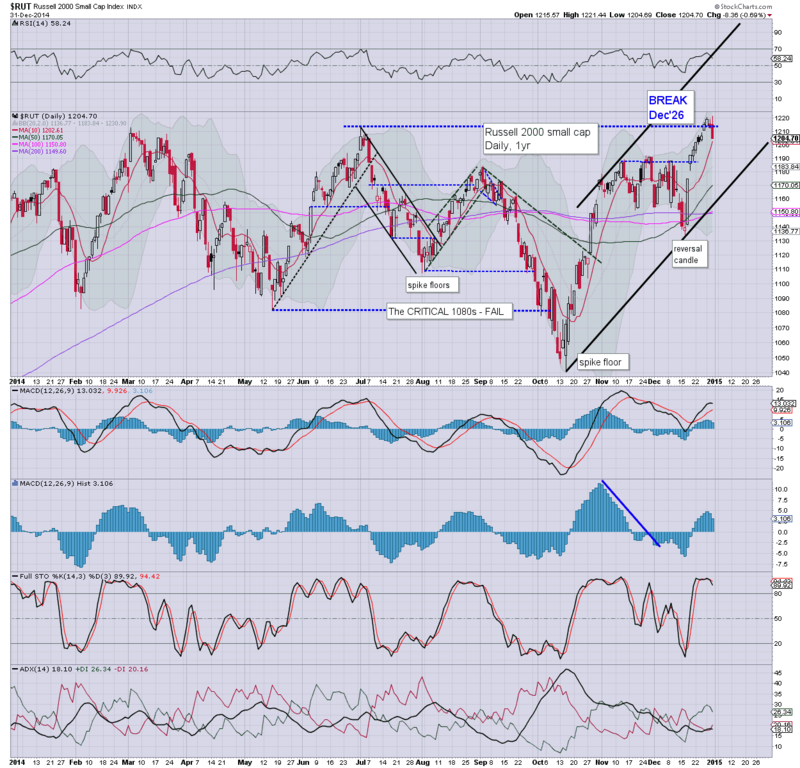 The R2K was the big laggard across the year, having seen a classic double top of 1212/13 in March/July.. to hit a cycle low of 1040. Surprisingly, the R2K managed to break a new historic high before year end of 1221.. and now looks set for 1250 in the near term. 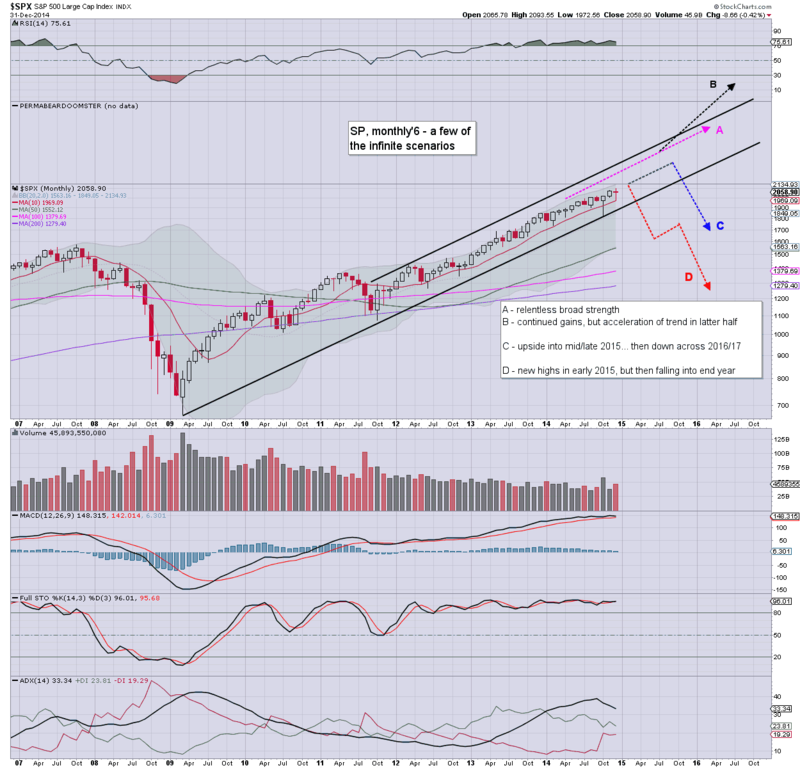 A much grander target of the 1500s look very viable in late 2015. Across 2014, Copper declined by -16.5%, and looks set for the low $2s in first half of 2015. The $3 threshold is going to be tough resistance, and considering the broader economic picture, it is entirely possible that $3 won't be seen again until well into 2016. Oil declined from $98.70 (June peak $107.68).. to settle at $53.27.. a net yearly decline of $45.43.. a simply astounding drop of 46%. I thought I was being bold to call for the $65/60 zone - when Oil broke support of $90 in October, but to see the low $50s... it really is amazing. Lower Oil is unquestionably a good thing for just about every sector (notably not energy!). Yes there are issues of debt, and lower capital expenditure... but those should be hugely outweighed by more money for the average consumer. Further.. most industry - whether manufacturing or service sector, should see significant efficiency gains via much lower energy/input costs. If Oil can remain under $70 for the entirety of 2015 - which now seems increasingly likely, it will be a massive stimulus boost to not just the US... but the world economy. The USD saw continued chop in the first half of the year, but since July... six months.. straight up. The yearly close in the 90s is VERY significant.. and bodes for 100 in first half of 2015. 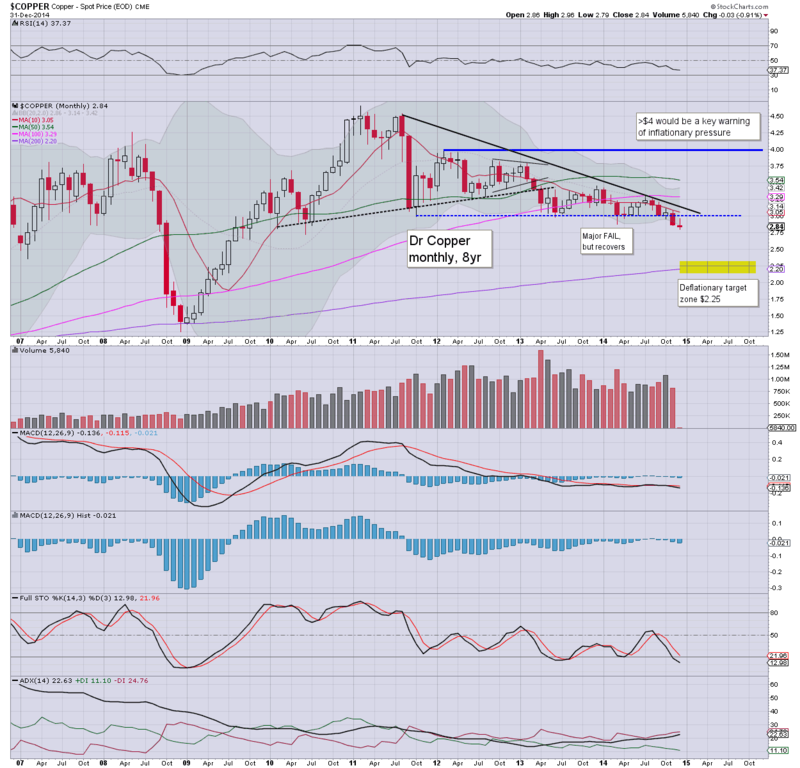 Higher USD will be a huge downward pressure on the precious metals and Oil. Yields peaked in January at 3.01.. and broadly fell across the year. The year end close of 2.17% does not offer a definitive floor, but I'm guessing yields have likely floored at 2.07. Will need to see 2.50s or higher.. for clarity. MACD (grey bar histogram) cycle is offering no sign of a turn yet.. but is clearly on the low end. In terms of the outlook... merely extrapolating the previous cycle provides a target turn time of late 2015... which might equate to equities maxing out in late 2016.. and collapsing into mid 2018. Certainly, its something I think merits consideration. I'll post my 2015 outlook... along with others end-2015 submissions this Thursday. 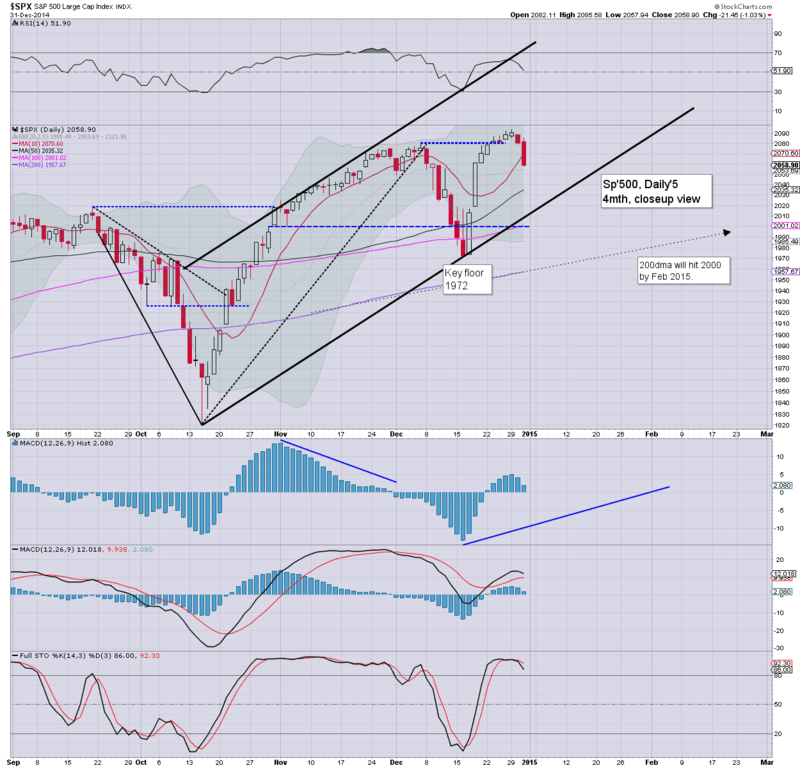 US equities saw some rather significant weakness into the yearly close, sp -21pts @ 2058. The two leaders - Trans/R2K, settled lower by -0.6% and -0.7% respectively. 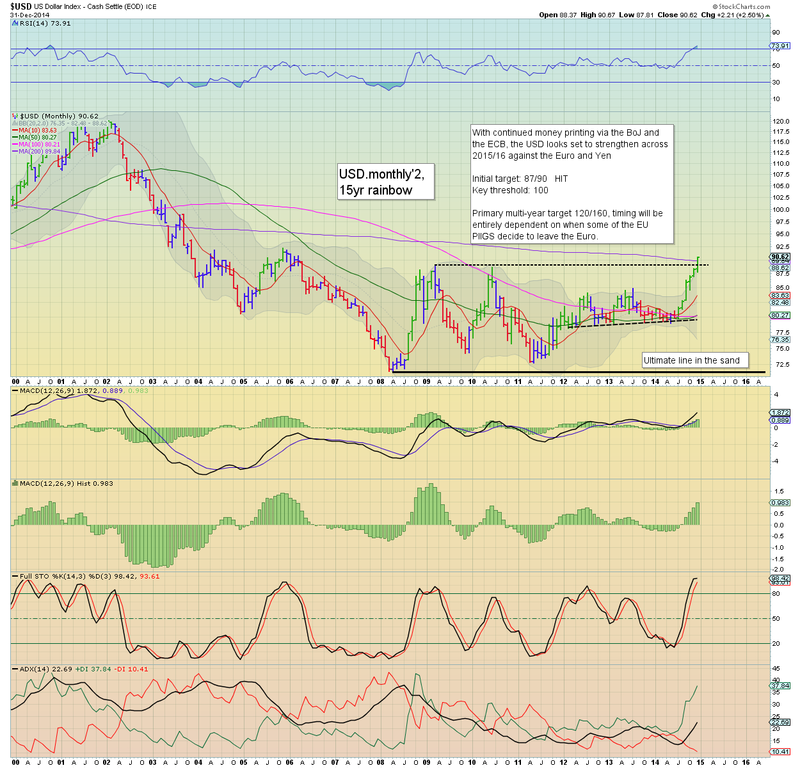 Near term outlook is for renewed strength into January... prime upside target zone remains sp'2130/50. There are arguably a great many 'year end' trading reasons why there was some unexpected strong weakness this afternoon. This was further reflected in the VIX, having come close to breaking the big 20 threshold. However, the broader trend remains bullish.. and the market continues to see a series of higher highs.. and higher lows. Barring a break of the pre-FOMC low of sp'1972, I can't take any of this weeks declines seriously.